I am originally an engineer who somewhere along his studies got fascinated by the complexity of biology. I have long experience of analyzing big data from different sources, and I see biology as the field which gives the biggest challenge and also greatest opportunity to further our understanding of the world. My research is so-called data-driven science, where data is analyzed as it is, without any prior hypotheses. It has been intriguing to see how the patterns of evolution and adaptation stand out when analyzing genomic data. My biggest research project so far has been the silver birch genome, but I have expertise also from microbial ecology. I have an MSc in engineering physics from Helsinki University of Technology and defended my DSc thesis in information sciences (machine learning) at Aalto University in 2008. 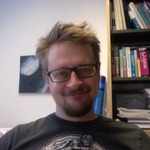 Since then I have been doing bioinformatics at University of Helsinki.